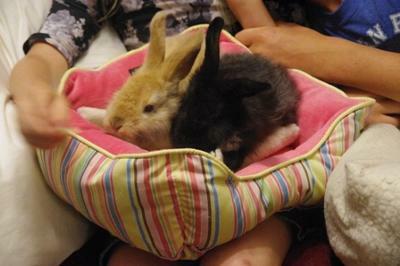 I have a Rabbit. We got her on the 8th of March, 2012. Her name is Pippi. 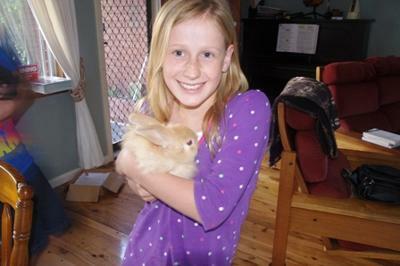 She is a lovely cream coloured Bunny. My brother also has a Rabbit whose name is Knight. Knight is black and is always so exited and happy to see you. When I go outside I often see them running around chasing each other and when you come to the cage they are so exited and come to you. My older brother has a guinea pig. It is brown and black and runs away from you. She is now pregnant and we are going to have some babies soon. 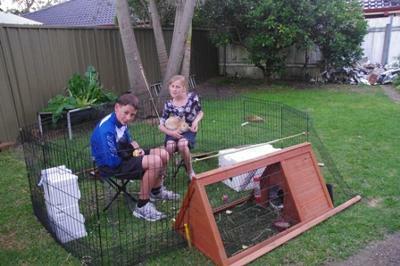 Our cage is quite small so we attached an outside play ring for them. Over the ring is some netting so birds and cats will not be able to hurt our pets. We used to have a dog. He was a welsh springer spaniel. He was such a lovely dog. He was brown, white and black. He was only allowed downstairs and he knew that but when there was a storm he came upstairs for he was frightened and wanted to be with us. So Rufus (our dog) was only allowed upstairs if there was a storm.